I'm back today to share a card I made using some great Simon Says Stamp stamps along with the very popular Zig Clean Color Brushes. 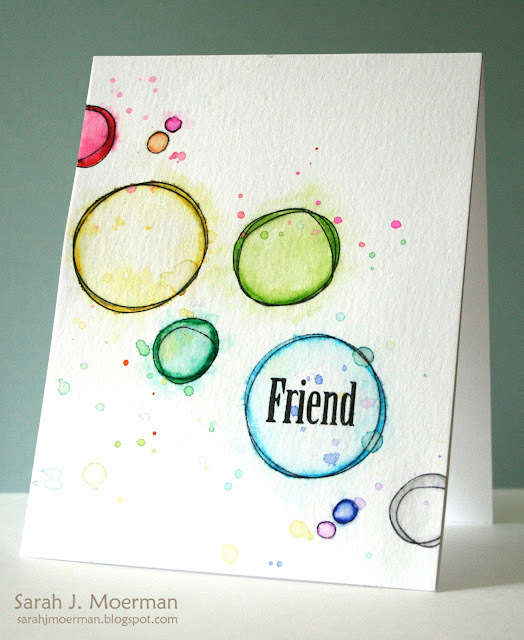 For this card I stamped some of the "circles" from Simon's Scribble Flowers Stamp Set using Memento Tuxedo Black Dye Ink and my MISTI tool onto Tim Holtz Distress Watercolor Cardstock. This was a mistake as the black ink bled slightly once I added water. I should have used Stazon or Archival Ink instead. Oops! Anyways, it wasn't too bad and so I just went with it. :) After stamping the circles, I used the Zig Clean Color Real Brushes to color just within the circles. (I just have the 12 pack so far). I then used a water brush to draw the colors into the circles. A bit of red ended up outside the circle and once again I just went with it and did the same with the rest of the circles. I scribbed the markers onto my Craft Sheet, added some water, and spritzed them onto my panel with a brush. Once the piece was dry, I stamped my sentiment from Simon's Artful Flowers Stamp Set with Versafine Onyx Black Ink and adhered it to my card. I love the whimsical feel of the scribbled circles with the vibrant Zig Clean Color Real Brushes. That's it for me! Thanks for stopping by for a visit! Wonderful design, love the watercolours! Sarah, I just saw your blog post. I'm in Asia right now. Will send you email :) THANk YOU! So light, colourful and lovely. Love love love. The imperfections make it perfect. What a beautiful way to recover from an error - you would hardly know! Glad you like the brush pens. I'm waiting on my 12 set to arrive...... Love this. Cute card...love how you embellished your quirks! So pretty! Thanks for sharing your card. this is so just simply awesome!! LOVE it!